The Yen came under selling pressure on Friday, as the Nikkei Manufacturing PMI, pointed to the first contraction in the manufacturing sector since August 2016, falling in February to 48.9, from 50.3 in January, the lowest in 32 months. 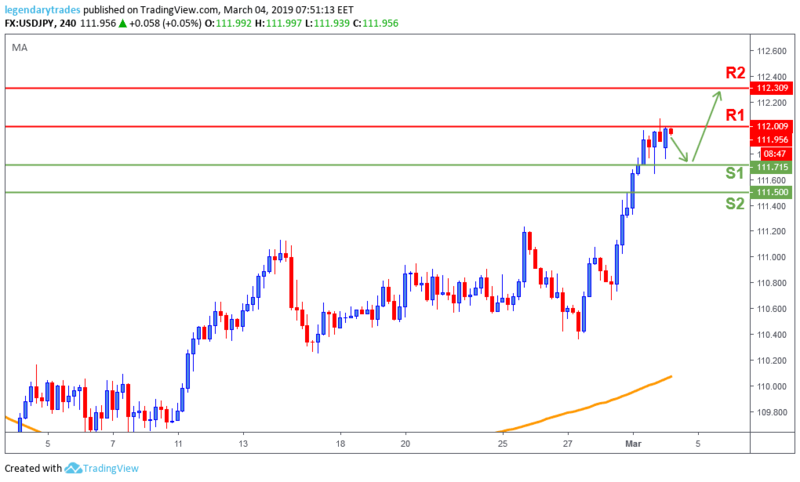 Despite US data, released later during the day, being far from encouraging, the USDJPY pair kept rallying on the back of the solid performance of the equities market. The NFP report as well as trade talks are in the limelight this week. Any significant headline can impact the pair. The Dollar/Yen broke to new yearly highs by reaching as high as 112.07 before pulling back and closing just below 112. Price action is still massively bullish, a pullback towards 111.75 (S1) is likely before we see further bullish momentum towards 112 (R1) and 112.30 (R2).